What is the rivalry that apparently exists between Taylor and Landon? Does it involve Stewart in any way? Q: What is the rivalry that apparently exists between Taylor and Landon? Does it involve Stewart in any way? A: Yes, I believe it actually does. What we, as the audience, see as concrete proof of this particular rivalry and its interaction takes place during the first twenty minutes of the movie "Planet of the Apes". Let's start with the opening scene, right after Taylor records his final log and takes his medication. Landon and Taylor dont seem to hit it off very well, or get along, anywhere in the movie. This interaction is evidently something that didn't 'just start' with the crash, but something that has been long running. Notice how Taylor looks at his crew in suspended animation, right after he does his last log and before he turns in for hibernation himself. Taylor stares down at Landon, like he could strangle him or reset his chamber to not let him ever wake up. The look is obvious veiled disgust with a strong vein of hatred. Taylor briefly looks at Dodge like he isnt a threat to him at all, or maybe he envies Dodge. Why? Because Dodge is so far removed from the socio-political / military aspect of the crew conflict that ignorance truly can be bliss. It is evident that Dodge is not a military person, but rather a civilian who was sent along the with the flight crew, probably for the PR factor. As a civilian, Dodge can ignore the jar heads and their petty disputes and concentrate on what he came to do; discover new things. ... then Taylor goes and stares longingly at the lovely Stewart, like there used to be something there between them, a flame, but just as the glass case separates him from her, something else, unspoken, intangible, a conflict we don't know of, does as well. I get the feeling of missed opportunities, lost dreams, and abandoned hopes. And I get the feeling that Landon is somehow responsible for Taylor's problems. For one second there, you almost get the feeling that Taylor is about to reach up and put his hand against the glass of Stewart's chamber, but in the end he realizes it is futile, everything they had is over and done with, and so he just climbs into his bunk, buckles in, and thinks to himself "Screw it." Four empty pilot seats are seen in f.g., the four glass caskets in b.g. We HEAR the RHYTHMIC BLEAT of a WARNING SIGNAL, a RUSH OF WIND as in a rapid descent, and perhaps the ROAR OF RETROJETS. Then, a great CRASH as the craft hits water. The whole ship shudders on impact. Loose equipment falls to the cabin floor. CAMERA MOVES DOWN the cabin aisle as the ship begins to roll in the water and HOLDS on the four glass caskets. There are THREE LOUD METALLIC CLICKS as the glass domes of the caskets swing open automatically. 19 DODGE AND LANDON - FROM TAYLOR'S P.O.V.- They, too, awaken and sit up, starring at Taylor. They, too, are bearded. TAYLOR'S VOICE (o.s.) "You all right?" 20 BACK TO TAYLOR - CLOSE SHOT- He glances at the casket beside his own. There is no answer from the fourth crewmember. 21 CLOSE-SHOT --THE FOURTH CASKET- Its dome remains unopened. The young woman is a skeleton in a Churchill suit. 22 REACTION SHOT - THE THREE ASTRONAUTS- Dodge and Landon have joined Taylor and-stare at the grinning skull of their dead comrade. A low, descending HUM of equipment is heard. Simultaneously the lights begin to FADE. A moment later they brighten, but not as much as before. TAYLOR- "There goes our primary power. We're on auxiliary." 23 REVERSE ANGLE - THE FORWARD CABIN- A trickle of water has begun to seep through a ruptured seam in the cabin. Taylor darts to a porthole and peers cut. 24 LONG SHOT - WHAT TAYLOR SEES: water. The porthole is no more than six inches above the line. In the distance we discern a shoreline of red desert. TAYLOR'S VOICE (o.s.) "We're in the soup. We're sinking." TAYLOR- "Dodge! Read the atmosphere!" Dodge moves instantly to the ladder beneath an escape hatch and mounts it. Taylor stumbles down the aisle of the rolling ship toward the console and addresses Landon, who is still staring at Stewart's skeleton. TAYLOR- "Landon! Send a last signal." TAYLOR- "To Earth! That we've landed!" Landon lurches toward the communications equipment in f.g. I would like to point out that when Taylor asks "Are you all right? ", he isn't referring in particular to Landon, who just jumped down from his suspended animation chamber, but rather to both Landon and Dodge, with more emphasis on Dodge, who, in the movie, nods most emphatically to Taylor's question where Landon merely stares blankly at Taylor. This use of the word 'you' should be better understood like the Southern colloquiums "Ya'll" or "you all", as in "Are ya'll all right?" meaning "are the two of you OK?" After the crash, the mood is much more pronounced, with open verbal arguments between Landon and Taylor. Landon: Climb off, will 'ya? Here we see that Taylor is jumping at the chance to tear open old wounds now that nothing matters anymore. He has a chance to take a stab at Landon and he does. He asks Landon why the hell he had to go and sign on for Taylor's crew? What did Taylor ever do to deserve someone like Landon yipping at his heels. The implication here is 'What motivated you to want this so bad? Was it your family? Your own aspirations? What really drove you to get into this mission because it sure as hell wasn't patriotism." Then Taylor remembers that Landon 'volunteered', which probably means that the 'volunteering' was more a PR thing, and that Landon used every political string and favor he could pull to get onto this flight, despite Taylor's objections to the contrary. Landon had apparently set himself up quite nicely in the public relations field, the reference to the 'golden boy of the Class of '72' indicates some type of academic rather and field experience, which goes to show that Taylor is a career military man, and Landon is an academic military man (think Annapolis or Air Force Academy, along those lines) and if he wasn't chosen for the Big One, that would be a slap in his face, and a serious mark against his career, or at least the one that he envisioned himself. Maybe Landon, when the reference comes to the 'golden boy of the Class of '72' refers to an astronaut training class, and Landon was the highest scoring / best ranking individual with the first shot to go on Taylor's mission. Landon was probably toe to toe with Taylor for command of this mission, with some in ANSA and the PR department actively pushing for Taylor to be second in command and Landon, the 'golden boy of the Class of '72' to be in charge of this flight. Another point of rivalry and contention, probably. Taylor keeps verbally pushing Landon. Taylor: ...oh, and the glory...don't forget that. There's a life-size bronze statue of you standing out there somewhere. It's probably turned green by now, and nobody can read the nameplate. But never let it be said that we forget our heroes. Landon: Taylor, I'm telling you to climb off! Here Taylor is really grinding it home when he's mocking Landon's personal self image. Perhaps the 'tarnished statue' is a reference to the fact that after all the grief and trouble that Landon went through to make it where he is now, that it all doesn't matter in the end. Sure, there's a statue of him somewhere, he gets an "A" for effort, but people have forgotten about him personally, and no one can read the writing on his epitaph anymore. He's a figure in the space race, but just a figure now, a lost memory, and no matter how hard he tried, it didn't work and now it really doesn't matter. The part about 'never let it be said that we forget our heroes.' is just another stab to Landon, meaning 'everyone you ever thought was your friend forgot you the moment they wrote us off as a failure." Landon's comeback here is telling Taylor to back off, that he has enough to worry about without Taylor rubbing it in and reminding him, but Taylor can't let a good thing go. After all the misery and grief that Landon has caused him, Taylor is finally getting some payback and he's cashing it in for all it is worth, riding all of Landon's character flaws to the very end. Taylor: And there's one last item... immortality. You wanted to live forever, didn't you? And you damn near made it. Except for me and Dodge, you've lived longer than anyone ever born. And with our lovely Lt. Stewart dead, looks like you're the last of the line. You got what you wanted, tiger, how does it taste? Here is where we get to the core of the rivalry; quite simply, Landon wanted command of the Big One, he wanted command of the first interstellar mission, and he wanted the girl as well. The fact that the girl and command both belonged to Taylor didn't phase him one bit, he was the 'golden boy of the Class of '72' and by all rights, nothing in this world (or any other) was beyond his reach and grasp. Landon stole Stewart away from Taylor, and tried as hard as he could to usurp command from Taylor before the actual launch was finalized. My theory is that while Taylor pulled himself up through the ranks with lots of hard work, courage, and actual military service (perhaps in Vietnam (early) or as a Korean War fighter pilot (late) and then test bed pilot for ANSA), Landon was more of an 'academy boy', rich, from a proud or prominent and influential, possibly political family (think "Kennedy"). Landon used all the personal and family political pull that he could to get command of the 'Big One', but in the end, Colonel George Taylor managed to hang onto that one prize with probably the hair of his chinny-chin-chin. Too solutions to one problem, two very different approaches. Taylor despised Landon for his method of moving up through the ranks and the political and influential pull that he could bring to bear. Let's look at this dialog closer, because there is a lot being said here. Taylor: And there's one last item... immortality. You wanted to live forever, didn't you? And you damn near made it. Except for me and Dodge, you've lived longer than anyone ever born. Taylor is chiding Landon for his mercuric rise to fame through no direct personal input. Landon is a 'daddy's boy', and a political brown-noser. His ambitions are his own, and usually will take precedence over the needs of anyone else. His desire to be immortal here shouldn't be seen as a actual physical desire to live forever in life, but rather in history and the media as being 'immortalized' by the hands of men, the inks of pens, and the flash of the media cameras. Landon wanted to be famous, he wanted to be the first to command the 'Big One' or America's trip to Alpha Centauri. Landon didn't want to live 'forever' in any real sense of the word, he wanted to live forever because he would be a part of human history much like the pyramids and the pharaohs are. Taylor is laughing at him here, pointing out that he'll live forever as a failure back home, and by a strange turn of events, as relativity would have it, he's managed to outlive anyone who would even remotely care about him being a failure. And... except for Dodge and Taylor, he would have had that honor all to himself, but sorry, even at the culmination of his own personal triumphant failure, he still has Taylor right there to show him how wrong he is and what a failure he is. The remark of "And you damn near made it." clearly shows that Taylor is only too happy to point out that even in failure, the best that Landon can do is fail. He's a failure at being a failure, and that is pretty sad. Taylor: "And with our lovely Lt. Stewart dead, looks like you're the last of the line." So Stewart held the rank of Lt., probably in the USAF as well. Somewhere, along the way, Taylor and Stewart were a hot item or maybe the hot item in the space program, that much is implied. Landon's infatuation with Stewart seems to be a painful point of contention between the two feuding would-be commanders. Landon almost scored the ultimate coup-de-grace against Taylor; he took his girl away from him, and he almost took Taylor's command and Taylor's shot at being in the history books. I think Landon, somehow, did take Stewart away from Taylor, or caused a rift between them. I also think that Stewart being on the team was Taylor's choice, he had plans for them together, after they were famous, after the mission, but Landon forced his way into the mission and screwed things up between them royally, charming Stewart away from Taylor and then the two of them making plans of their own that didn't involve Taylor at all. Dodge seems to, again, be a neutral participant in this feud, which means that he's not military, but civilian and as such, he wasn't privy to all the background struggle that has gone on between Taylor, Stewart, and Landon. 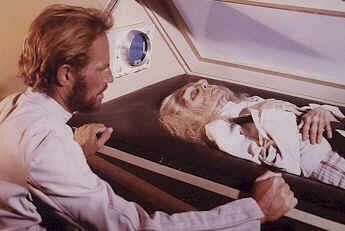 Notice how Taylor looks at Stewart while she is in suspended animation after he finishes the 'final log'. Then look at how Landon stares at Stewart's corpse, dazed, even as the ship is sinking around him. Taylor has to give him a direct order to snap him out of his self induced catatonia. Here is that part of the movie again to refresh you. Notice how Dodge reacts instantly to the danger around them, Taylor tries to organize his crew, giving vital commands, and Landon just stands there, lost, knowing that everything he ever wanted is finally gone, it fled from his grasp, and his best effort was for nothing. The reference to 'our' lovely Lt. Stewart obviously shows that there was a three way love triangle going on here. Landon waltzed in, took Taylor's girl, and almost, almost took his ship. It is those two reasons above anything else for which Taylor despises Landon. The fact that Stewart and Landon might have had plans to marry at a later date is also evident by the statement Taylor makes of "... looks like you're the last of the line." meaning that being stranded on an unknown planet, without his 'mate', that his dreams and plans of marriage and starting a family, and subsequently cranking out more of the Landon Line (tm) as heirs is all turned to ashes now. Taylor is giddy in this fact. Taylor: "You got what you wanted, tiger, how does it taste?" This statement really confirms my theory and rubs it in. Taylor is reminding Landon of the old proverb; "Be careful what you wish for, it might come true." in that Landon wanted to go down in the history books, he wanted to be immortalized, he just had to be on Taylor's mission, and he had to have Stewart. Well, Taylor is saying, you got what you really, really wanted. How do you like it now? The reference to the nickname 'Tiger' generally means a really energetic (and troublesome) little boy. I think that the word is used quite well in this regard for Taylor to call Landon by this term. Landon is a spoiled little brat, the kind of person you really don't ever want on your team. Taylor: We've got food and water enough for three days. This to me means that their supplies are emergency only, and very temporary. This also points to the fact that they can't be a colonization attempt, they don't have the supplies. Four astronauts with food and water for three days. But... is that food and water for FOUR astronauts for three days or three astronauts for three days. Did the estimate include Stewart, or not? I'm not sure... If the estimate included Stewart, then the astronauts would have a little better than that, since with Stewart dead, they could take her share of the rations and distribute it evenly among the three survivors, or roughly 25% more apiece. Dodge: How long is a day? Taylor: That's a good question... Landon? (shouting to get Landon's attention) Hey Landon! Join the "expedition"! This statement here seems to prove to me that not only was Taylor's crew not supposed to land at their destination, that their destination isn't really where they were supposed to be in the first place. When Taylor tells Landon to 'Join the expedition! ', he's being facetious. He's rubbing it in that they are in deep doo-doo and that if Landon really wants to be in command, he had better get with the program and start showing some command initiative. He's also calling Landon out, basically saying "well, this is what you wanted, why don't you start acting like you're enjoying it." Landon: Sorry, I was thinking about Stewart. Meaning that there was something between Landon and Stewart. Taylor has already forgotten about her (as evidenced by the statement below), and Dodge could care less because it isn't his affair or his problem. However, Landon just won't let it go, he won't accept his failure, his unwanted fate, that everything he wanted in his career, the girl and the ship, is on the bottom of a inland lake and no one will ever know about his accomplishments, or probably care. Taylor here is hiding his true feelings, he's not about to let Landon see that he still cared for Stewart or that her death moved him (which it did, if you watch his facial expression when he first sees her corpse). His stance and expression betray Taylor's true feelings, but he's a realist and a survivor, and in the midst of a spacecraft rapidly filling with water around him, he just doesn't have the time to waste for tears on something that was over 2000 years ago. He'll mourn in his own time, in his own way. Basically, Taylor is saying "I've forgotten about her. You made sure of that. Why can't you let it go as well?". The "What about her?" is tantamount to someone saying "So what?" Landon: What do you suppose happened? Taylor: Air Leak. She died in her sleep. Taylor says the word "sleep" kind of dreamily, like it was an easy thing, and this brings back memories of fairy tales like "Sleeping Beauty" and "Snow White". In fact, the way that Taylor looks at Stewart before he goes into suspended animation is reminiscent of the prince first seeing "sleeping beauty". He's basically having a small fantasy surrounded by memories from a time when he, and Stewart, were happier, when everything had a future and a place. A time before Landon. Landon: You don't seem very cut up about it. Taylor: It's a little late for a wake. She's been dead nearly a year. This obviously shows that Taylor has put his past and his feelings behind him, he's facing facts and an incredible turn of events that have suddenly relieved him of all of his burdens. He's accepted that everything between him and Stewart is over and finished. Long ago. Relativity and Hasslein's theories have erased any plans that he ever had for he and Stewart. It was all over before they ever left Earth, anyway, and that was 2006 years ago. Anyone who might have cared besides Taylor, Landon, and Stewart herself are long gone so the hell with it. Taylor's expression as he looks at Stewart through the glass of her suspended animation chamber clearly shows this. This dialog only proves it, further making the point that there used to be something between Taylor and Stewart, and that Landon is somehow the cause of the problem. Taylor is reveling in the fact that Landon is anguishing in his own sorrow, that Landon was right within reach of the finish line, that he had the prize in his sight, that his fingers were slipping around the prize ... and he stumbled, falling face first, right in front of the finish line. Taylor: Our time...you've gone gray. Apart from that, you look pretty chipper for a man who's 2,031 years old. I read the clocks. They bear out Hasslein's hypothesis. We have been away from Earth for 2,000 years...give or take a decade. Still can't accept it, huh? Time's wiped out everything you ever knew. It's all dust. Here is more evidence that the crew were investigating the phenomena near Alpha Centauri, Taylor talks of "Hasslein's hypothesis" which he apparently feels that, even in accident, that they have proved to be scientific fact. Here Taylor is really rubbing it in. He (and the crew) know that they have run afoul of something like a Hasslein Curve, or that they fell into the phenomena that they were sent to investigate. The 'give or take a decade' might be a more accurate reading of why Taylor's chronometer says 3978 and Brent's reads 3955. Maybe, using the last telemetry from Taylor's mission, right before it fell into the Hasslein Curve, ANSA and Hasslein were able to somehow 'adjust' Brent and Skipper's chronometers for a more accurate reading when traversing the phenomena. Landon: Prove it. If we can't get back, it's still JUST a theory. Here we have Taylor giving up on his attack on Landon probably out of growing frustration. His attack isn't hitting Landon as hard anymore, and its only reinforcing Landon's resolve, perhaps to the point of possible psychosis. Taylor just can't believe that Landon won't accept reality and the situation that they are in, that Stewart is gone, the ship is gone, they are no where near where they should be, and with the ship gone, there is no way home. Taylor is wondering why, when everything is so obviously over and done with, that Landon is still holding on to the hopes and dreams and designs that he had. "Prove it! Prove that you're right and I'm wrong! Prove that everything that I worked so hard to get is nothing now! Until you, Colonel George Taylor, prove THAT to me, I simply refuse to believe it and therefore until I accept to believe it, it is just more of your nonsense. We WILL get back. We HAVE to get back. I HAVE to get back... I'm too important to wind up stranded here and no one knows where I am or what happened to me." We see Taylor telling Landon, with this last closing statement, that Landon had better believe it, that the sooner he believes what is going on is really happening and comes to grips with reality, that the sooner Landon can put his guilty conscience to rest and sleep better at night. Taylor feels that Landon is probably feeling pretty low and bad now, and Taylor is going to rub it in, because for the first time in a long time, it is Taylor who is holding all the cards, and Landon who is down on his luck. Landon is out of his natural element where Taylor is right smack in the middle of his. Landon doesn't have anyone to impress now, no favors to call in, no people to write about him or take pictures for the cover of TIME and LIFE magazine. Landon is completely lost, more so than the entire ship and crew and Taylor loves it. Landon: Well, where are we? Do you have any notions, Skipper? Taylor: We're some 320 light years from Earth on an unnamed planet in orbit around a star in the constellation of Orion. Is that close enough for you? Dodge: It's too white for Bellatrix. Thinking about it, that is a bad situation to be in. You're stuck on an unknown planet, 2000 years in the future, with your chief rival and your ex-girlfriend who your chief rival stole from you. You just lost your ship, your ex-girlfriend, and any chance at getting back home and now you're stuck with the one person in the whole universe that you would really rather NOT be stuck with. Rivals for the affections of a woman and the command of America's first starship. Stranded together at the end of time... it's poetic irony. Taylor understands the situation but Landon is oblivious to his fate.